There is so much to talk about, essentially the podcast is coming back. The last four months I was in intensive Amazon business and there are some exciting announcements coming out of that incubator soon. I worked out a deal where I go back to my natural state of being a content creator and media dude and will help with the promotion of those amazing business products soon. I just had to come back to Global From Asia. And we are restructuring quite a bit here. Over the last 4 months many of you have been asking what is up, and I am so happy to have your care. We give some mentions during the podcast today and it is just me on the microphone sharing about the future. Some thought we/I stopped doing the HK CPA work, but that is moving along with Ray Ng our CPA partner at Unipro keeping things running with our amazing team. That is the beauty of building a business. We will have to update people on Ecommerce Gladiator, but Sisitano did well in q4 with approx 30k top line in December and decent margin but we ran out of stock in Jan which hurt ranking but are recovering. Will update people soon. Cross Border Summit – man, everyone loves this event! Mark Ramos is working with us on it and we are bringing it to Guangzhou Oct 22-23, 2019 for the fourth annual. Spun CBS out of GFA and it is its own website and strategic alliance business. Cross Border Association – the GFA VIP membership and the membership in general was hard for people to even find in the GFA website. GFA is a media site and a content site, we are happy to have new partners and forming structure for this, but may need to wait a few more months before opening it up much. GFA Bootcamp – this will be the flagship product for Global From Asia. Been based down here in Thailand coming on to a year now and GFA essentially is a learning center. What better way to learn than an intensive live event bootcamp. We will do our first one this summer, July 2019, 7 days full day with experts from our community hosting half day or full day sessions on Amazon FBA, ecommerce, and cross border business expansion. This aims to be the core offer and core product at Global From Asia. If you enjoy the podcast and blog and want to engage with me and the others in the community, this will be a full-on way to do so. So – we are re-structured and re-invented. What is most exciting is that we are opening up the doors for more opportunities to offer the community. Since emailing our subscribers last week we have had a huge response about the bootcamp, the summit, and everything. Let’s really work together to take the community to the next level. 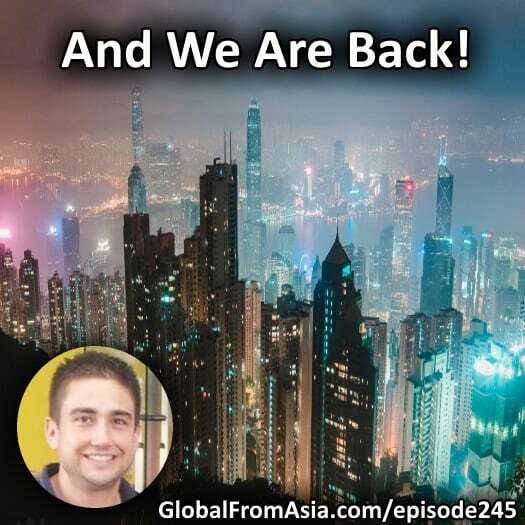 Hope you are still subscribed to the podcast, or hit re-subscribe 😉 Already have 3 amazing interviews recorded and will be getting back to weekly – Tuesday – 10am Hong Kong time release.